Zeinali, T., Jamshidi, A., Khanzadi, S., Azizzadeh, M. (2015). The effect of short-time microwave exposures on Listeria monocytogenes inoculated onto chicken meat portions. Veterinary Research Forum, 6(2), 173-176. Tayebeh Zeinali; Abdollah Jamshidi; Saeid Khanzadi; Mohammad Azizzadeh. "The effect of short-time microwave exposures on Listeria monocytogenes inoculated onto chicken meat portions". 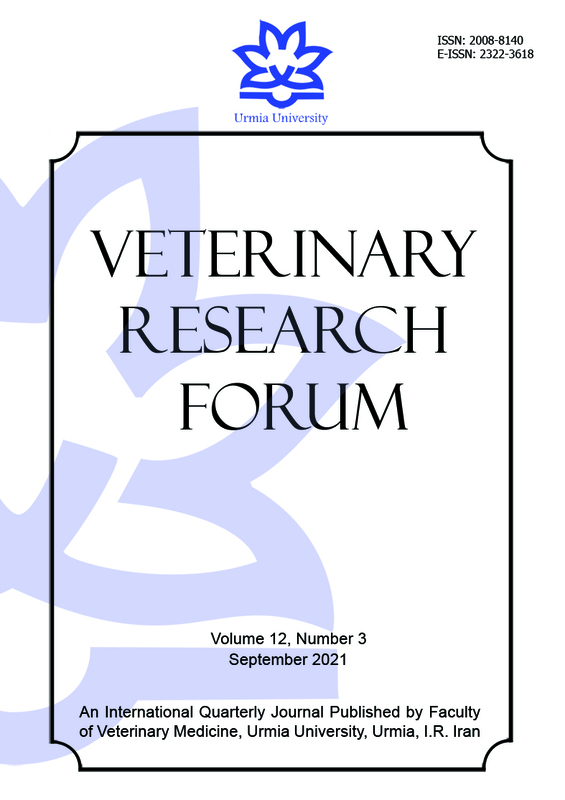 Veterinary Research Forum, 6, 2, 2015, 173-176. Zeinali, T., Jamshidi, A., Khanzadi, S., Azizzadeh, M. (2015). 'The effect of short-time microwave exposures on Listeria monocytogenes inoculated onto chicken meat portions', Veterinary Research Forum, 6(2), pp. 173-176. Zeinali, T., Jamshidi, A., Khanzadi, S., Azizzadeh, M. The effect of short-time microwave exposures on Listeria monocytogenes inoculated onto chicken meat portions. Veterinary Research Forum, 2015; 6(2): 173-176. Listeria monocytogenes can be found throughout the environment and in many foods. It is associated primarily with meat and animal products. Listeria monocytogenes has become increasingly important as a food-borne pathogen. The aim of this study was to evaluate the effect of microwave (MW) treatment of chicken meat samples which were inoculated with L. monocytogenes. Drumettes of broiler carcasses were soaked in fully growth of L. monocytogenes in Brain-Heart Infusion broth. The swab samples were taken from the inoculated samples, after various times of radiation (10, 20, 30, 40, 50, 60, 70 and 80 sec), using a domestic MW oven at full power. Following exposures, viable counts and surface temperaturemeasurements were performed. The bacterial counts were performed on Oxford agar. The results indicated that equal or longer than 60 sec exposures of chicken portions to MW heating which enhances the median surface temperature more than 74 ˚C could eliminate the superficial contamination of chicken meat with L. monocytogenes. Statistical analysis showed samples with equal or longer than 60 sec exposures to MW heating had significant decrease in population of inoculated bacteria compared with positive control group(p < 0.05). Pearson correlation showed a significant correlation between the bacterial population and temperature of samples due to MW exposure (p < 0.001, r = – 0.879 and r2 = 0.773). Several decontamination methods on food surfaces have been introduced, including thermal and non thermal treatments. Microwave (MW) can be classified in physical non-thermal treatment. High frequency energy including MW and radio-frequency energy belongs to the non-ionizing radiations. Microwaves lie between the infrared and radio frequency portions of the electromagnetic spectrum.10 In a MW oven the heating of food results from molecular friction between water molecules under an oscillating electric field of specific frequency.11 Heating by MW energy is used for several purposes, e.g., cooking, pasteurization, sterilization and blanching of foods.12,13 The safety of MW cooking in relation to foodborne pathogens is questioned. There are studies reporting complete inactivation of microorganisms including pathogens, in inoculated cooked foods or reheated in MW ovens.13,14 The aim of the present study was to investigate the effect of different times of MW heating on the fate of L. monocytogenes, inoculated onto drumette of broilercarcasses. Preparation of the L. monocytogenes inocula.Pure cultures of L. monocytogeneswere prepared by sub culturing the test strain (L. monocytogenes: ATCC 7644)into 500 mL of brain heart infusion broth (BHI; Merck KGaA, Darmstadt, Germany), following incubation at 32 ˚C for 24 hr. The concentration of the resulting culture was determined by preparing serial dilutions and viable count by surface plating on Oxford Listeria selective agar (Merck KGaA, Darmstadt, Germany). This culture media were used for inoculation of the chicken meat samples. The absorbance of the cultured media were also determined in 600 nm wave length, using a spectrophoto-meter (Model 6105; Jenway, Essex, UK), to inoculate the same dose of bacteria in repeating the experiment. To determine thenumbers of surviving L. mono-cytogenes after each exposure, decimal dilutions from each swabs containing tube were prepared and total viable count were performed by surface plating on the Oxford Listeria selective agar following incubation at 32 ˚C for 24 hr. Statistical analysis. The statistical analysis was performed using SPSS statistical software (Version 16; SPSS Inc., Chicago, USA). A non-parametric Kruskal-Wallis test at p < 0.05 was used to determine the effect of time of MW exposure on L. monocytogenes viability. Pairwise comparison of viability of L. monocytogenes between positive control and other groups were investigated by the Mann-Whitney U test considering Bonferroni adjustment. The relationship of inoculated bacterial population viability with temperature of samples due to MW exposure was examined with Pearson correlation test. Pre-existing contamination with L. monocytogeneswas not detected in any chicken meat samples. The concentration of cultured media inoculated with L. monocytogeneswasdetermined as 1.6 ´ 106 CFU mL-1, using total viable count method,15 and its absorbance at 600 nm determined equal as 0.640. 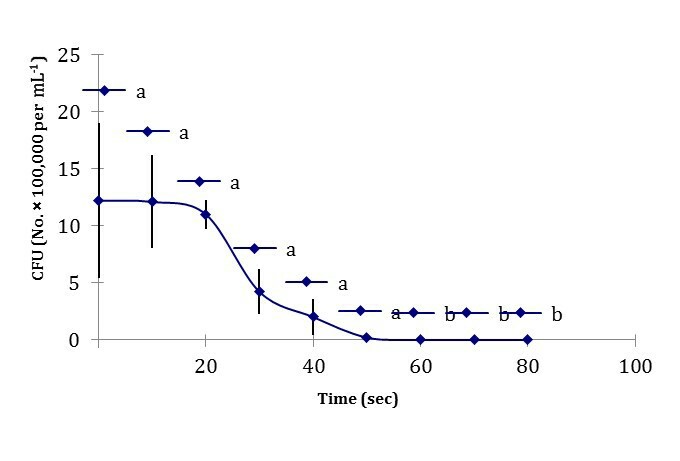 The bactericidal kinetics of MW for L. monocytogenesand for different exposure times is shown in Figure 1 and Final surface temperature of drumettes after different time of microwave exposure is shown in Figure 2. 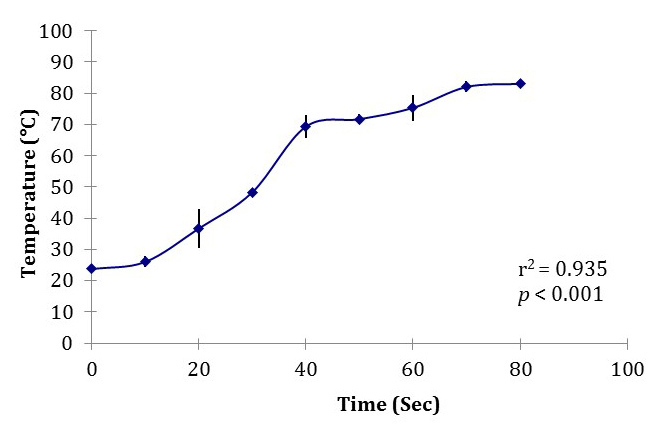 Elimination of L. monocytogeneswas observed after the end of 60 sec exposure time, when the median surface temperature was increased to 74 ˚C. Statistical analysis showed samples with equal or longer than 60 sec exposures of chicken portions to MW heating had significant decrease in population of inoculated bacteria compared with positive control group(p < 0.05). Less than 60 sec of MW exposure didnot have significant difference in regard to population of inoculated bacteria. Pearson correlation showed a significant correlation between the bacterial population and temperature of samples due to MW exposure (p < 0.001, r = – 0.879 and r2 = 0.773). Fig. 1. Destruction of Listeria monocytogenes as a function of microwave exposure time in drumettes of broilercarcasses. Values followed by different superscript letters are significantly different (p < 0.05). Fig. 2. Final surface temperature of drumettes after different time of microwave exposure. Microwave ovens have become common household appliances in developed countries and, to some extent, in developing countries. This relatively inexpensive technology is commonly used to cook or warm foods in homes, offices, and some restaurants. With respect to consumer safety, the research reported here showed that MW radiation could be used to control (to reduce or sometimes to completely eliminate) microbial potential pathogens in food. According to our study induction of 74 ˚C superficial temperature in chicken meat portions could eliminate the inoculated bacteria, which itsprimary contamination rate with L. monocytogeneswas1.6 ´ 106 CFU mL-1.The duration of radiation with full power to produce this temperature was 60 sec. In conclusion, consumers can use MW ovens to significantly reduce microbial pathogens in foods like chicken meat portions. Microwave irradiation is a cost-effective, practical, fast, easy, and safe method of decontaminating foods. The authors express their sincere appreciation and thanks for the financial support recieved from Faculty of Veterinary Mediciene, Ferdowsi University of Mashhad, Iran for conducting this research (Grant No. 3852). Aygun A, Pehlivanlar S. Listeria spp. in the raw milk and dairy products in Antakya, Turkey. Food Control 2006; 17(8): 676-679. Choi WS, Hong CH. Rapid enumeration of Listeria monocytogenes in milk using competitive PCR. Int J Food Microbiol 2003; 84(1): 79-85. Schuchat A, Deaver KA, Wenger JD, et al. Role of foods in sporadic listeriosis. J Am Med Assoc 1992;267:2041-2045. Brett MS, Short P, Mclauchlin J. A small outbreak of listeriosis associated with smoked mussels. Int J Food Microbiol 1998; 43(3): 223-229. Frye DM, Zweig R, Sturgeon J, et al. An outbreak of febrile gastroenteritis associated with delicatessen meat contaminated with Listeria monocytogenes. Clin Infect Dis 2002; 35(8): 943-949. Demetrios K, Bori M, Antonios M. Growth of Listeriamonocytegenes in the whey cheeses, Myzitheria, Anthotyros, and Manouri during storage at 5, 12 and 22 ˚C. J Food Protect 1996; 59(11): 1193-1199. Schillinger U, Kaya M, Lucke FK. Behaviour of Listeria monocytogenes in meat and its control by a bacteriocin- producing strain of Lactobacillus. J Appl Microb 1991;70(6): 473-478. Farber JM, Peterkin PI. Listeria monocytogenes, a food borne pathogen. Microbiol Rev 1991; 55(3): 476-511. Norrung B. Microbiological criteria for Listeria mono-cytogenes in foods under special consideration of risk assessment approaches. Int J Food Microbiol 2000; 62(3): 217-221. Jay JM, Loessner MJ, Goden DA. Modern food micro-biology. 7th ed. New York, USA:Springer 2007; 373-375. Pucciarelli AB, Benassi FO. Inactivation of Salmonella enteritidis on raw poultry using microwave heating. Braz Arch Biol Techn2005;48(6): 939-945. Giese S. Advances in microwave food processing. Food Tech 46(9):118-123. U.S. FDA website. Kinetics of microbial inactivation for alternative processing technologies-microwave and radiofrequency processing. Available at: http://www. fda.gov/Food/FoodScienceResearch/SafePracticesforFoodProcesses/ucm100250.htm Accessed May 02, 2013. Heddleson RA, Doores S. Factors affecting microwave heating of foods and microwave induced destruction of foodborne pathogens – A review. J Food Protect 1994; 57(11): 1025-1037. Vanderzant C, Splittstoesse DF. Compendium of methods for the microbiological examination of foods. 3rd ed. Washington DC, USA: American Public Health Association 1992; 57-59. Farber JM, D'aoust JY, Diotte M, et al. Survival of Listeria spp. on raw whole chickens cooked in microwave ovens. J Food Protect 1998; 61(11): 1465-1469. Woo IS, Rhee IK, Park HD. Differential damage in bacterial cells by microwave radiation on the basis of cell wall structure. Appl Environ Microb2000; 66: 2243-2247. Schnepf M, Barbeau W. Survival of Salmonella typhimurium in roasting chickens cooked in a microwave, convection microwave and conventional electric oven. J Food Safety 2007; 9(4): 245-252. Jamshidi A, Seifi HA, Kooshan M. The effect of short-time microwave exposures on Escherichia coli O157:H7 inoculated onto beef slices. Afr J Microb Res 2010; 4(22): 2371-2374. Apostolou I, Papadopoulou C, Levidiotou S, et al. The effect of short-time microwave exposures on Escherichia coli O157:H7 inoculated onto chicken meat portions and whole chickens. Int J Food Microbiol 2005; 101: 105-110. Goksoy EO, James C, James SJ. Non uniformity of surface temperatures after microwave heating of poultry meat. J Microw Power Electromagn Energy 1999; 34: 149-160. Huang L, Ites J. Automatic control of a microwave heating process for in-package pasteurization of beef frankfurters. J Food Eng 2007;80(1): 226-233.